Edible Thanksgiving crafts are a fun way to get ready for the holiday season. Three fun projects for kids of all ages are Thanksgiving Oreo turkeys, marshmallow pilgrim hats and cornucopia snacks. Follow the simple instructions for these projects for edible Thanksgiving craft fun for everyone! 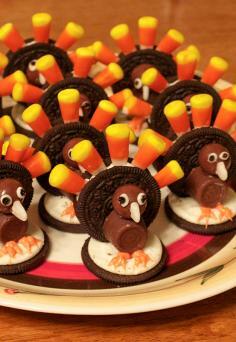 Oreo turkeys are one of the most popular edible crafts for Thanksgiving. This craft is simple enough for a preschooler to make with just a bit of adult assistance. Open one Oreo. Keep the half with the filling as the base for the turkey; eat the other half if desired. Place a second Oreo upright on the filling to make the turkey body. Place five pieces of candy corn, pointing into the filling on the upright Oreo to make your turkey feathers. Add a Rolo to the front of the turkey to make a body. Use a dab of icing on the back of the Rolo to help it stick to the Oreo. Place a dab of icing onto a malt ball, then stick it on top of the Rolo (with the icing facing the Rolo and the Oreo) to make the head. Attach the white tip end of a candy corn to the malt ball with more icing. Pipe on icing eyes and feet. Enjoy your tasty Thanksgiving decoration. 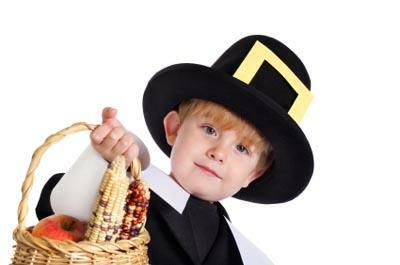 Pilgrim hats are another fun treat for a Thanksgiving day celebration. Dip cookies in melted chocolate and sit on wax paper. Dip marshmallows in melted chocolate, then place on cookies so they adhere as the chocolate sets. 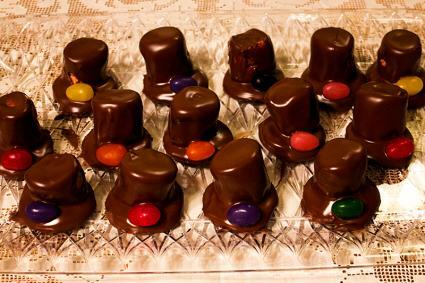 Add jelly beans to use as hat buckles. A cornucopia is a traditional symbol of Thanksgiving, which makes it a wonderful choice for an edible holiday craft. Fill each ice cream cone with a small amount of frosting. Add fruit snacks to represent different elements of the Thanksgiving cornucopia. 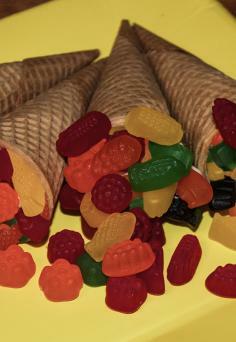 If you want to make a healthier version of this craft, you can simply fill the ice cream cones with dried fruit and nuts. Buy more supplies than you think you'll need. If you have young helpers for these projects, they're going to find it hard to resist sampling the goodies. You may also find that you end up with a few broken cookies or projects that just don't look quite right. Planning ahead is normally a good idea, but you don't want to make edible Thanksgiving crafts too far in advance of the celebration. Ideally, these projects should be made a day before the big event. Get everything ready before you begin. Little crafters are notoriously impatient, so it's important to make sure all your supplies are ready to go before the project gets started. Remove cookies from their packages, unwrap hard candies, and place jelly beans in a plastic bowl. A covered container made for transporting cupcakes is the best choice for moving finished edible crafts to their final destination with the least amount of breakage. Use these projects as a party activity or as a small gift for visiting children. They also make good table placecard holders or favors. Don't forget to keep a camera handy for taking plenty of pictures. Edible Thanksgiving crafts won't last long, so you'll want a photo to help remember the project!